Gatherings are all about social interaction with folks of like mind, which means exchanges, activities and—of course—letterboxing. Here are tips to get you through a very busy, very chaotic, but very exciting day. 1. Come early: Coming right when the event starts ensures a few things. First, you'll get to meet your hosts and check out the stamps before the mad rush of other attendees arrives. Anything that needs to be handed out at a gathering (like clues and other tidbits) might be limited, so showing up first ensures you'll get it. By midday the area will be swarmed with people and food and boxes and ink. By coming early, you'll be able to sit down and stamp into the event book and start exchanges without having to wait your turn. 2. Stamp into the event book first: Every gathering has an event book to stamp in with your personal stamp and an event stamp to impress into your own logbook. Do both of these the moment you arrive because it may be a challenge as more and more people arrive. 3. Wear a name tag: Most events provide you with name tags to stamp your signature stamp and write your trail name onto, but if not, bring something of your own to identify yourself. Most folks will know you from your stamp, so be sure that's on your tag, too. 4. Check around for traveling event stamps: Traveling events stamps move from event to event all over the country so that everyone has a chance to get the stamp and log in. Larger events usually have several traveling events stamps floating around. You can usually find a table with these on it, so ask your host where it is, then go stamp in before everyone else starts to swarm the tables. 5. Check around for hidden boxes: Yes, even at a gathering where it's obvious we're all boxing and people tend to be less secretive about their stuff, boxers will still hide things that you won't even know about until after the event. Check under tables, in the corners of the pavilion, in the bushes nearby, in the food containers, and anyplace else that's not someone's stuff. You might be surprised at what you find. 6. Exchange with other letterboxers: One of the other fun things about letterboxing is exchanging stamps with other people. These count as X in your PFX-count. There will be some folks you only know by their signature stamp or trail name on the message boards and websites. Walk up and introduce yourself. Soon you'll be sitting at a table with other people stamping into each other’s logbooks and talking about the trail. 7. Ask about personal travelers: Some folks carry around a personal traveler (or two or more), which is just a letterbox that follows that person. Not everyone has them, so the best thing to do is just ask. Another great idea is to check Atlas Quest and do a search of the personal traveler letterboxes and bring those with you to the event. Instead of the embarrassing, "Um, so what do I do to get your box?" question, you'll know what it is you need to know to get it. People also appreciate that you took the time to research it. 8. Go letterboxing: One of the things that many people end up doing wrong is never leaving the pavilion to actually do some letterboxing. Remember, you're in an area that you haven't boxed before. Try to go for the local area boxes that you might never see again as well as the boxes that are out for the gathering. Also, gatherings make for a great time to buddy up and letterbox with someone and continue your talk. At big events, you might find yourself waiting in line to get a box. So, don't wait until too late. Stay and chat a while, but go box, too. 9. Take some pictures of people: You'll meet folks that you won't remember later, so bring a camera to be sure you'll know who they are later. Also, it helps the event coordinators if they can get pictures from others to post in the wrap up and photo albums online. Most of them are so busy they never get to leave the pavilion, so it's a nice way to help them remember a great time, too. 10. Be back in time for pictures, raffles, and other planned events: At some point in the event will be the group photo and some other fun stuff you may want to be involved in. Be sure not to miss at least the picture so you'll have that to look back on with your stamps and exchanges. 11. Join someone for dinner: After the event is over, many locals love to join out-of-towners for dinner—plus they know where to eat and you don't. Check and see if anyone is up for a meal and more time to hang out and talk. This is something you can check before you come to the event. Just ask the people you do know if they want to get together and invite others to join you. It's often less chaotic and gets you more quality time to chat than the hustle and bustle surrounding an event. 12. Box again the following day: Usually, an event starts on a Saturday, so plan out your Sunday for boxing, too. If you arrive in town the day before, you can box then as well, but if you're from the area, let the out of town folks have a chance at being the first finders on boxes. 13. Share your photos from the event: Once you get home, share your photos through the Photos section of Yahoo Groups or the Photo Album here on Atlas Quest. Other letterboxers—both attendees and those who didn’t—will be interested to see your photos. Just as with letterboxing as a whole, certain conventions and rules have developed when it comes to letterboxing events. Here are the most common you'll want to keep in mind. 14. Don't bring hitchhikers: This is something that's been the subject of heated debate, but many people do not want their hitchhikers to attend events. Hitchhikers are meant to be found in a box, not passed around from person to person. Additionally, most hitchhikers do not have large logbooks and cannot support the stamps of dozens or even hundreds of people. If the hitchhiker is your own, then feel free to share. Or, if you want to get the hitchhiker moving, place it in a box. But, do not leave hitchhikers on the table for people to stamp in freely. 15. Don't be lax about discretion: Just because a lot of letterboxers are around doesn't mean that there are not a lot of non-letterboxers. The same rules about being sneaky and rehiding properly apply, especially here. Nothing is more disappointing than having someone take the time to carve and send a box to a gathering, then having it stolen because someone carelessly left it out in the open while chatting. 16. Watch out for cooties: For once, this is a good thing. Cooties are like hitchhikers that follow people instead of letterboxes. Normally, a friend or someone near you will slip a cootie into your bag or pockets while you're not looking. Once you find it, do not place this into a regular letterbox. Stamp into it, then try to pass it off onto someone else as soon as you can. After all, you really only get to see other boxers at these events, so you don't have much time to infect them. Cooties are a type of letterbox where one tries to sneak around hiding a stamp (and often an optional logbook) on another person—perhaps in an open backpack or jacket pocket. Once you 'catch a cootie', you stamp in and try to pawn it off onto another unsuspecting letterboxer. Cootie Catcher is an open and unattended backpack or bag that often collects quite a large number of cooties—and thus they are called cootie catchers. 17. Seriously—GO BOXING...: Can't stress this enough. You will want to sit and talk all day, but you will miss some great boxing. Whoever you're talking to, take them with you and enjoy the day and the letterboxes. After all, most of these boxes are donated, so you may never see them again. Can you live with the guilt? I think not. Now, if you live near the gathering area, anyway, then this might not be such a big deal for you. In that case, be sure to visit a little more with some of your friends and neighbors. After all, you can hook up with them the next weekend to hit those boxes if you live close by. Then you have a new boxing buddy. 18. Be considerate of others while letterboxing: Everyone wants to stamp into the traveling event boxes and the other hidden boxes in their area, so make sure to be fair about holding the boxes. While you're exchanging with others, don't "hang on" to a box you've found, or grab multiple boxes to stamp into. Take one at a time (tedious as it may sound) and return it before doing anything else (eating, exchanging, taking a bathroom break, etc.). 19. Bring food: Unless otherwise stated, all gatherings are potluck. Bring something to contribute so you won't feel guilty eating. And don't feel like food is the only thing you can bring. If you're coming from far off, perishable stuff is not a good plan, but water, snacks, and even ice and supplies (plates, cups, napkins, utensils) would all be greatly appreciated. Check with your host to see what they already have and what they might need. 20. Give to your favorite local charity: Think about letterboxing events like public broadcasting without the quarterly beg-a-thon. Your support helps us continue this great tradition of letterboxing and social events. Reserving the pavilion, getting extra food and supplies, mailing out letterboxes and the like does take time and money that usually comes out of only a few people's pockets at your event. So, it's never a bad idea to donate a little something, no matter how small and no matter what gathering you attend. No one will ever ask you to make a donation at a gathering and no one will ever think less of you if you don't. However, every little bit helps. Finally, gatherings are lots of fun, but can be overwhelming. Stay hydrated, take a buddy and a water bottle with you, eat right, and don't be surprised if you end up stamping into your own logbook a few times in the shuffle. In 2009 I was living in Ohio and a member of the Miami Valley Flyfishers (MVFF). 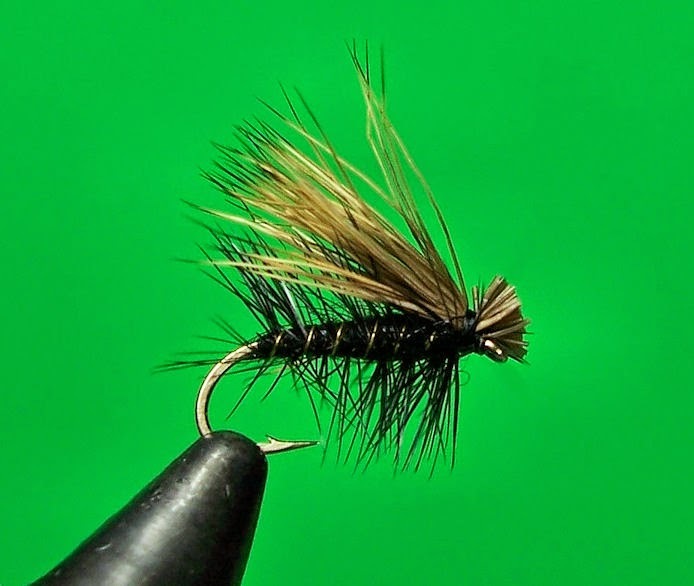 I was active in the flytying program. That year several things happened almost coincidently. ** Dave Oertel, a past president of MVFF, got us involved in Project Healing Waters. What a great program. I participated. ** I was planning a BIG RV trip through western US for 2010. ** I began "Blogging" using Google Blogger – a tool that at that time was far less developed and at times infuriating. ** I was starting to get involved in Geocaching – a worldwide scavenger hunt game using a GPS receiver to find hidden caches of trinket treasure. 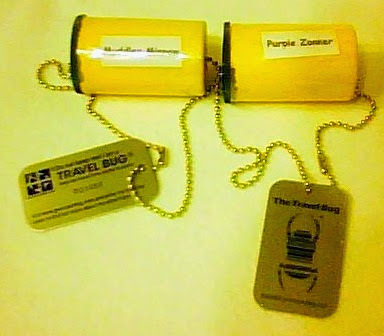 Geocaching employed the concept of a Travel Bug using an alpha/numeric dog tag as a tracking device. ** I discovered Kirk Werner's three book series for kids using twelve original cartoon characters to introduce them to flyfishing. The books' central character was "Olive the Woolly Bugger". I bought the set as a Christmas gift for my granddaughter. I read them myself and got acquainted with all twelve characters. Then came the big idea. Create twelve geocaching travel bugs, using Kirk Werner’s twelve characters, to carry the Project Healing Waters message around the country. I would start each travel bug by placing them in geocaches at various locations during my big RV trip in 2010. We would also create a blog to record and publish the club's activities in Project Healing Waters including snippets on the travels of the twelve travel bugs. 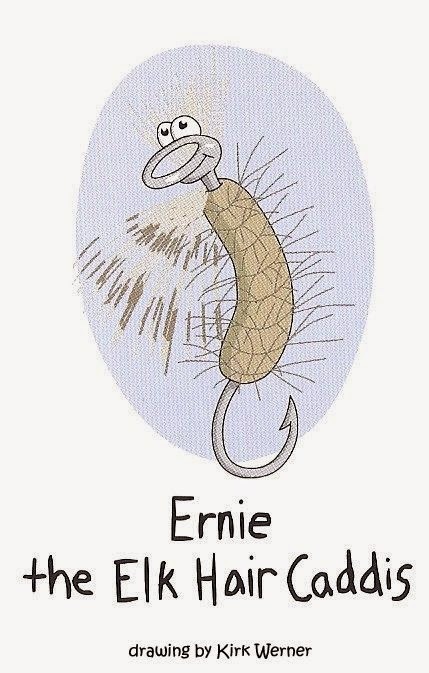 "Geocaching, Blogging, Travel Bugs, Olive the Woolly Bugger, Kirk Werner ????? WTFO" When I brought the idea to the club Board of Directors, I got the visual and verbal response of "We haven't a clue what you are talking about. Frankly, we don't care. Go outside and play." So I did. I contacted Kirk Werner and his publisher and received permission to use the characters in the manner I just described. I created the blog. I purchased twelve Travel Bug Dog Tags from Groundspeak, the owner of the geocaching website. I rounded up twelve 35mm film canisters and I created twelve similar single sheet messages about Healing Waters and MVFF to go into the canisters. In the summer of 2010 Michelle, our dog Bailey, and I took our trip. Our home on the road was our 2010 Dodge Ram 1500 truck pulling a pop-up camper. We travelled from Ohio to Colorado, Montana, Idaho, Wyoming, Minnesota, and Michigan. The trip included two weeks in West Yellowstone where I attended the annual IFF conference. During the trip I placed eleven of the twelve travel bugs. Number 12 never got launched. I gave it to someone to launch for me and it disappeared. The whole trip covered 11,000 miles and took 80 days. Over the next two years, I monitored the progress of my twelve prodigies on the geocaching website. Some of them had extensive travels and the log entries indicated many fly fishermen found the travel bugs and moved them along. I got an email every time there was any recorded activity. There were a lot of messages of appreciation in the logs. The whole thing made me feel good. A few of the travel bugs never made it out of the starting gate. It is impossible to know whether there was no physical movement or just failure to log the movement on the geocaching website. By 2012 all activity had ceased and I considered all travel bugs missing. Meanwhile nobody in the club had made any posts on the blog and queries indicated no interest in continuing. So I considered the project over and I shut down the blog. As a side note, our 2010 trip changed our life. We have sold our stix and brix house and now travel the US full–time in our 2011 Keystone Cougar High Country Fifth Wheel pulled by that same 2010 Dodge Ram 1500. We winter in Titusville, FL and take summer adventures somewhere else in the US. Early in 2014, while wintering in Florida, I learned that the Travel Bug numbers belong to me FOREVER!. So when a Travel Bug goes missing, I can recall the number and reissue it. WOW! I spent most of 2014 doing just that. I decide this is my project and I do not want it to die. I dragged all twelve of the numbers back to my inventory. I recreated the travel bugs – this time as a laminated business card attached to a duplicate dog tag. The front is an image of the Werner character and the back is the Healing Waters message. On 30 Dec 2014 I relaunched the last of the twelve in Colorado. All twelve are now out on the road for the second time carrying the Healing Waters message. I have also developed a section within my own travel blog devoted to this project. That is what you are looking at now. You can see a lot by clicking on any of the links below. By getting into geocaching.com you can read all of the log entries for each of the travel bugs from their original launch. Unfortunately you have to sign up if you are not a member. No big deal, basic membership is free. Then select Play/Find Trackables/Enter Tracking Code. These are the tracking numbers for the twelve travel bugs: TB3E3X5, TB3E3Y2, TB3E3X7, TB3F6AD, TB3F69B, TB3F6AW, TB3F69V, TB3F69Z, TB3F6AV, TB3F6A3, TB3F6A5, TB3F6A0.